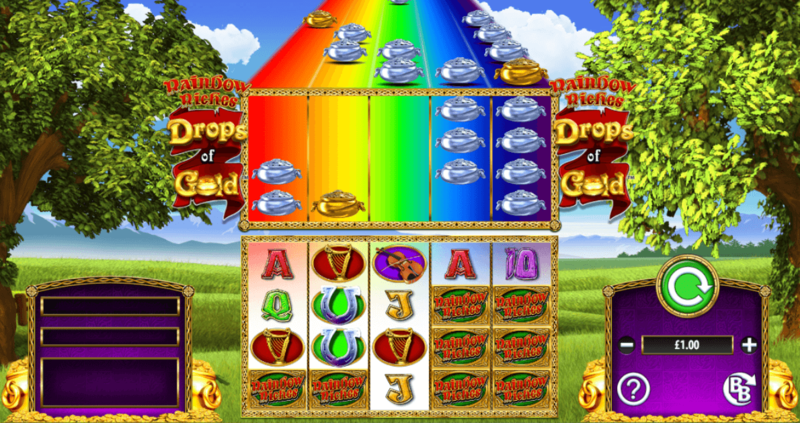 Rainbow Riches: Drops of Gold is a 5 reel, 200 ways to win slot game with a 97.75% RTP. 3 scatters Bonus symbols in view at the end of a spin triggers the Free Spins Bonus and awards 8 Free Spins. Thought you’d seen it all from the Rainbow Riches franchise? Prepare for the most exciting slot game yet from Barcrest which celebrates the unique culture of Ireland. The 5 x 4 reel grid offers a whopping 200 different ways to win and a 97.5% return to player rate! All of that comes alongside the wild bonus features along with the 50 / 50 double or nothing bonus feature too! Chances are that you are reading this because you’ve already played on some of the earlier Rainbow Riches slots and you are wondering what the latest addition to the franchise is all about! At Money Reels we are more than happy to present the online slot which may just be the best one yet. Barcrest and SG gaming put plenty of innovation into Rainbow Riches Drops of Gold, just as they have with all of the of the earlier releases. However, as Drops of Gold was released in June 2018, the two gaming giants have put their new tech and talent to good use! Even people who don’t even play Rainbow Riches are well aware of the franchise, it’s become fairly legendary since the original game was released all the way back in 2006! 12 years later, our slot players still can’t get enough of the original. However, it has to be said that the visual experience has been improved tenfold, potentially more! Barcrest and SG also like to make sure that they go all out with the bonus features too! Drops of Gold is definitely no different! Just in case you’re totally new to the online slot world and the games from Barcrest and SG, we’ll let you know what the Rainbow Riches franchise is all about before we move on to explain how the game is played and just what bonus features you will be enjoying as you spin the reels. Ireland has always been a popular location for online slot developers to explore with their online slots. The Emerald Isle is renown for being one of the luckiest places you could possibly be! This is due to the fantastic culture and folklore which has refused to be forgotten, no matter how much of a modern world we find ourselves in. Ireland has the associations of rainbows with pots at gold at the other end, lucky leprechaun, and the home of the four leaf clover – even if you can find four leaf clovers all over the UK! The same can be said for rainbows too, but only in Ireland can you expect to find a pot of gold at the end – we’ll still go with the theory that you are able to find the end of the rainbow! But, legend has it, that at the end of a rainbow, you will be able to find a pot of gold which will be guarded by a leprechaun. But, we’ve been pretty presumptuous in the past to assume that leprechauns would be happy to give up their pots of gold easily! In modern culture we have been misled a little on the nature of leprechauns. They’re actually fairly evil and they would only give up their gold if they were buying their freedom. I’m sure you have no intention of capturing a leprechaun to make them beg and buy their way to freedom. So, a much better suggestion is that you spin the reels on Rainbow Riches Drops of Gold instead! While Rainbow Riches Drops of Gold is a sequel to the original, you’re transported to a brand-new picturesque scene in Ireland. This time, you’ll see the background depicting a forest in the autumn. The grass is still green and lush, but the brown leaves are starting to form piles on the ground. Also piled on the ground are the golden coins which you will hope to win as you spin the reels on the online slot. Although you won’t get to see much of what is going on in the background due to the large size of the 5 x 4 reel grid which has been framed by a stunning gold Celtic pattern. All of your stats will also be framed in gold! So, it is safe to say that Rainbow Riches Drops of Gold has a very regal feel which will definitely put you in the mood for winning large amount of gold for yourself! You’ll also be able to see plenty of Ireland’s culture on the reels through the specially-themed symbols. You’ll see clovers, harps, pots of gold and fiddles! We’ll introduce you to the basic set up of how the game works down below. It’s at this point that we should probably point out that as much of a great online slot game that Rainbow Riches Drops of Gold for beginners, as there is quite a bit to get to grips with. But if you’re up for an action-packed exciting challenge, you’re found to find plenty of reasons to fall in love with the online slot from Barcrest and SG! First of all, the reel grid isn’t your standard set of reels. Above them lies a rainbow which is always waiting to bestow you with golden and silver pots of gold as you spin. If you’re lucky enough for this to happen (and you will be) that’s when you will receive massive amounts of money from the game. This is just one of the fun bonus features which Rainbow Riches Drops of Gold offers you. The symbols are a mix of specially-designed symbols and standard symbols which you will have seen on other online slot games. K, J, Q, and 10 = 200 when you match five. The specially-designed symbols are far more generous with what they pay out. Here’s what you can win from matching them! The Rainbow Riches symbol = 1000 coins when 5 are matched. You really couldn’t ask for more from standard wins which you will see during the gameplay. As well as the symbols being able to seriously boost your bank balance, they’re also incredibly effective in bringing you a little bit closer to the culture of Ireland. There are also special symbols to look out for on the reels which will really enhance your gameplay experience. The wild symbols don’t appear on the reels in the usual way, instead, they are always waiting in the rainbow which is hovering above the rainbow. There’s not one, but two wild symbols; the silver pots and the gold pots. There’s no particular formula to making the pots appear on the reels, but when they do appear, they will help you to make winning combinations by replacing other symbols on the reels. The only symbol which the wild won’t be able to replace is the scatter symbols – which is a fairly common set up for a wild. Yep, that’s right, there’s also more than one scatter symbol for Rainbow Riches Drops of Gold too! There are three to be exact, which will all help you to unlock a different bonus feature. As the RTP is set to 97.75%, you will be able to expect plenty of wins from Rainbow Riches Drops of Gold. If you would like to increase your chances of winning, you can always take advantage of the 200 different bet ways. The more bet lines you place a bet on, the higher your chances of winning will be! Although you may find that you only need to place a bet on one to constantly boost your coin balance! With sequels to online slot games, usually, not all that much has been mixed up to make sure you fall in love with the franchise all over again. But Barcrest have always liked to do things a little differently! Ever since they teamed up with SG their games are bigger and better than ever. And that includes what they offer from their bonus features. The first clever twist on the gameplay which we have already mentioned is the way that the wilds will drop from the top of the reels. This will happen when the Rainbow Riches logo falls on the 5th reel, when this happens, the pots that are at the bottom of the rainbow will drop down and replace the other symbols and lead to pretty big wins! The second bonus feature is a much more straight forward offer of free spins! You’ll need to find the symbol which reads ‘Bonus’ above a pot of gold. You’ll need to find three of these to trigger the game. However if you find more, you’ll receive even more spins. Here’s how many free spins you can get your hands on! But that’s not all you are limited to! You can retrigger the free spins at any point during the free play mode. There is absolutely no limit to how many free spins you can win! The third bonus feature to Rainbow Riches Drops of Gold is the ‘Big Bet’ bonus features. While those playing on a small budget won’t really be able to take advantage of it, it’s certainly a perk for the high-rolling players. You will be able to take advantage of this feature when you place down a stake of £20. This will allow you to make the most out of the wild symbols which will expand when they fall. When the wilds expand and cover two entire rows. And don’t forget about the rainbow which is always waiting to shower you with wilds! £20 is a fairly high stake amount to place as you spin the reels, but the rewards are always super high. Just make sure that you are playing within your budget! However, for those wanting to make some serious money you can choose to play with £30 and get all of the fun features that you got by playing with £20, but there are extra added perks too! When you throw down £30 on a spin, you will see all of the lower-value symbols disappear from the reels. Leaving you with only the highest-valued symbols, wilds and triggers! We appreciate it is a lot of money for anyone to throw down on a spin, but for those who can afford it, it’s definitely worth it. If you’re feeling REALLY flush, you can really test out your luck with the £50 super big bet! With a £50 bet, the number of pay lines which you will be playing on will shoot up to 100 if you’re in the main mode of gameplay. The number of bet lines goes even higher if you are playing with free spins to 200! Barcrest have been around since before the internet, before the personal use of computers, back in the days when it was acceptable to wear flares and everyone’s kitchen was orange. Yep, the swinging 60s. Of course, they never knew that they were going to set out to be one of the biggest online slot game providers in Europe back then. In 1968 Barcrest became renown as one of the most reliable manufacturers of land-based gambling products such as one-armed bandits along with a host of other gaming solutions. Though their offices were in the UK, they shipped their terminals all across Europe and were considered to be the industry-leaders back then. Their terminals were found in casinos, pubs, bars, and pretty much you would ever see a slot machine all across Europe. Their name became synonymous with quality; as it still is today! While they did exceptionally well for themselves without the internet, when the digital age dawned, they were one of the most prepared companies to jump on the bandwagon and welcome in a new age of gaming to slot machine fans. Even though Barcrest were the pioneers of the dawn of online slots, their games are still incredibly popular even today thanks to their ability in remaining bang on trend. This means that all of their online slots are highly compatible with mobile gaming, as the mobile versions of the games are never created as an afterthought! It was the original Rainbow Riches slot game that shone the spotlight on their online content in 2006. Although they have had success with many of their other online slots, this hasn’t stopped Barcrest from creating plenty of sequels to help players celebrate the magic once more! Even though Barcrest is a well-established industry in itself, back in 2011 they decided to team up with media giants Scientific Gaming who had also been making plenty of waves of their own in the online slot world. SG recognised Eyecon as a business worth investing in, so that’s exactly what they did when they bought Barcrest merging their talent with another game developing company named Global Draw. Three giants all standing together ensured that the new corporation was a powerhouse of talent, tech, and innovation. Yet, SG have been keen to allow Barcrest to keep their own cute and charismatic style which enabled them to create slots such as Rainbow Riches. Speaking of which, here’s what Barcrest had to say about the online slot after they released Rainbow Riches. They released their statement on their website, where you may be able to get a better idea of the game play experience through playing a demo. But don’t forget to come back to Money Reels, we’re as generous with our free spins and perks as Barcrest are! They didn’t say much, but by now Rainbow Riches online slot games speak for themselves when it comes to quality! It really should come as no surprise that we will be listing all of the other games in the Rainbow Riches franchise here! There are 6 different games for you to consider, including the original! Even though Rainbow Riches slot was an iconic slot back in 2006, you can’t expect any online slot to stand the test of time for over 13 years, so the graphics aren’t as great – just as you saw with the original Star Wars film, and you can’t love the original series any less due to the graphics! The original online slot is still adorable and playful and boasts some of the most impressive bonus features. Even by today’s standards! You can imagine how many minds were blown when the reels were spun originally on the slot which offers 20 pay lines and a return to player rate of 95%. The 2016 slot was the first of the sequels, and it allowed players to tailor make their bonus experience by allowing to pick which ones which will pop up during the game. You’ll get a choice of 5 but only be able to take advantage of three. So, it’s safe to say that the online slot game you can personalise to your own tastes was a massive hit! Rainbow Riches Pick N Mix slot with RTP rate will vary between 96 and 98%. Rainbow Riches Reels of Gold slot was yet another 2016 release from Barcrest! However, they might have gone a little bit overboard with this one we have to say! There’re loads that you’ll need to learn before you fully grasp the gameplay, but if that’s exactly what you’re looking for you’ll have plenty of fun with the two sets of reels, 100 different bet lines and eight separate bonus features! Yes eight bonus features!! The game also comes with a fairy which can come along at any given moment and switch up the symbols on the reels! There’s a lot to learn, but a lot to gain considering that the RTP is 98%! The clue is probably in the title with this online slot! But this was the third online slot which Barcrest and SG cooked up together. If you have found that the bonus features in any of the other online slots in the series are a little too complicated, this may just be the perfect game for you. They’ve taken the excess games away and just used a classic which every slot fan will love. Yep, all Rainbow Riches Free Spins has to offer are free spins. So, as you could expect, they haven’t cooked up your average free spins round. Your free spins will also come with some nifty multipliers to enjoy too! They have put no limit on the amount of free spins which you will be able to enjoy. Although the number of pay lines have been capped to 10. To make sure the lack of bet lines doesn’t hinder the gameplay experience all too much, they’ve taken away some of the symbols so you will achieve more wins that way! Yet another 2018 release, this one acts much more like a sequel than the others as it captures the charm which you enjoyed with the original. It comes with the added perk of being released in this decade! Barcrest and SG had a massive year in 2018, as this title was yet another one to be released from the game designers! The jury is still out in terms of popularity, but at Money Reels we still think it’s a solid offering with a 5 x 5 reel grid, 100 bet line, and some awesome bonus features!